29th September 1953 The Carousel Ballroom, Manchester, New Hampshire. The series of ‘Concerts in Miniature’, 25-minute broadcasts, went from April 1952 until November 1953. They document the life and music of Kenton’s finest band for that period of time. They are a unique record. The orchestra was the greatest band of Kenton’s career including: Lee Konitz, Frank Rosolino, Zoot Sims and Bill Holman. There were writers such as Gerry Mulligan, Bill Russo, Shorty Rogers, Pete Rugolo and Bob Graettinger creating a library that was both innovative and intriguing. The period covered by this twenty third album was just after the band’s six-week tour of Europe. That was the time when English fans had to trek over to Dublin to see the band because the UK musicians Union did not allow American musicians in to England. The first concert is from New Hampshire and the other two are from New York's Birdland. Highlights are numerous. ‘Zoot’ by Bill Holman features in an ingenious arrangement where the band back the fluid improvisation of Sims. This piece was never recorded in the studio so the in-person versions are particularly valuable. The composition displays Holman’s gift of making the writing sound as though it was an essential part of the improvisation. Kenton was particularly pleased to have Lee Konitz in the band. He probably thought that this icon of the Tristano school gave the band cachet. ‘Loverman’ the feature for Konitz was arranged by Bill Russo. Konitz is also featured on the propulsive ‘23 degrees north 82 degrees west’ another Bill Russo composition. The piece also features Frank Rosolino displaying the fluency that brought him such acclaim at that time. Kenton feared sounding like Basie or Herman and he wanted occasionally to challenge his audience with concert pieces. : ‘A Theme of Four Values’ by Bill Russo is one of those moments. The piece features trombonist Bob Burgess and is in contrast to light rhythmic pieces by Holman and Rogers. Holman wrote ‘Fearless Finlay’ and the orchestra seem to enjoy weaving its way through the counterpoint with solos from Schildkraut, Candoli and Rosolino. The compilers of the CDs have retained Kenton’s introductions which range from the pompous to humorous. 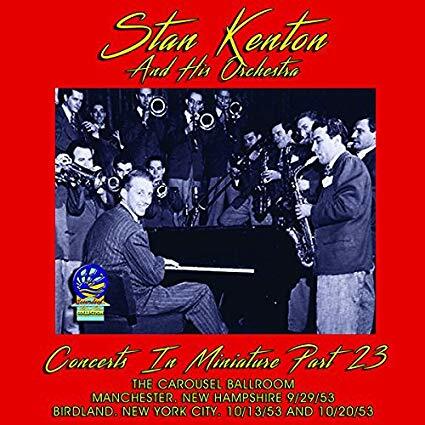 The notes are supplied by Michael Sparke, a leading authority on Kenton, and they have anecdotes that illuminate what was happening to the band and the musicians at that time. The recording, as is usual with the Concerts in Miniature, is acceptable without being detailed.